The Soko J-22 Orao (Eagle) is a twin-engined, subsonic, close support, ground-attack and tactical reconnaissance aircraft, with secondary capability as a low level interceptor. It was designed as a single-seat main attack version or as a combat capable two-seat version for advanced flying and weapon training. It was developed as a joint Yugoslav-Romanian project in the 1970s for the air forces of both nations, SOKO building it in Yugoslavia, and Avioane Craiova as the IAR-93 Vultur in Romania. On 20 May 1971, the governments of Romania and Yugoslavia signed an agreement for the formation of YuRom, a joint R&D venture. The program was headed by Dipl. Dr. Engineer Teodor Zanfirescu of Romania and Colonel Vidoje Knezević of Yugoslavia. The aircraft was intended as a replacement for the lightly armed Soko J-21 Jastreb and the Republic F-84 Thunderjet, then in the JNA arsenal. The requirements called for a light aircraft to be built on a simple structure, using locally produced equipment and avionics, tough (able to operate on grass or damaged runways), easy to maintain and reliable. The aircraft was of conventional twin-engine, high mounted wing monoplane configuration with all flying surfaces swept. The designers originally planned a single-engined supersonic aircraft, but Britain would not authorize the license for the engine the designers wanted (due to Romania being in the Warsaw Pact), so the less-powerful Rolls-Royce Viper was chosen as the powerplant, as Soko had experience with license-building this engine. It was originally intended that an afterburner would be developed for the Viper engines, but there were prolonged difficulties with this project, meaning that none of the pre-production aircraft featured it, and neither did early production examples. During the 1980s, both countries developed slightly different versions to take advantage of the afterburning engines that had since become available. The Yugoslav prototype 25002 made its first flight in November 1976 from Batajnica Air Base near Belgrade, with Major Vladislav Slavujević at the controls. The third aircraft, numbered 003, a pre-production two-seater version, made its first flight on 4 July 1977, but was lost almost a year later due to tail flutter problems. Construction continued, and the first batches of pre-production machines were delivered in 1978 to the Air Force Aircraft Testing Facility in Belgrade, with serial production being set up in Mostar, Bosnia and Herzegovina. On 22 November 1984, Orao 25101 piloted by test pilot Marjan Jelen broke the sound barrier in a shallow dive over Batajnica Air Base, becoming the first Yugoslav-designed aircraft to exceed Mach 1. The aircraft is incapable of breaking the sound barrier in level flight, so it is classified as subsonic. Picture - Yugoslav J-22 deploying drogue parachute. The first SFR Yugoslav Air Force unit which received J-22 aircraft was the 351st (reconnaissance aviation squadron) from 82nd Aviation Brigade, Cerklje. Until the 1991 war, there were only three squadrons fully equipped with J-22 attack aircraft and NJ-22 trainer-attack aircraft. Those units were the 238th (fighter-bomber aviation squadron) from 82nd Aviation Brigade, 241st and 98nd Aviation Brigade and 242nd and 127th Fighter-Bomber Regiment, Golubovci Airbase. There were also about three squadrons partly equipped with J-22 aircraft. At the beginning of the Yugoslav wars, in Slovenia, J-22s flew over in a show of force, but did not drop any bombs. 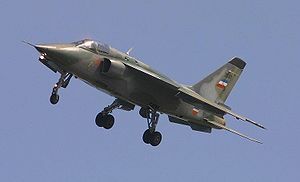 The first offensive action by the J-22 was in 1991 when the Yugoslav National Army used them to strike targets in Croatia. They were used in attacks on arms dealers which were smuggling weapons into Croatia. During the first year of war three J-22s were shot down, NJ-22 flown by Lieutenant Colonel Muse Begić who ejected safely and a J-22 flown by Major Z.Tomić (KIA) from 238th. After the withdrawal of the JNA from Slovenia, 82nd Aviation Brigade was relocated from Cerklje to Banja Luka Mahovljani air base. In 1992 when the Bosnian war started, the JNA left one squadron of J-22s to Republika Srpska Air Force, that squadron was the 238th. Those aircraft were used in numerous combat operations during the war. In 1999, Yugoslav J-22s saw limited combat against the KLA flying 20 combat missions. One J-22, piloted by Lt. Colonel Života x�urić was lost on 25 March 1999 in unclear circumstances, either through malfunction, pilot error or KLA ground fire. In addition, 11 aircraft were destroyed on the ground, most at Ponikve airbase when a NATO air strike hit one hangar with six J-22 and two MiG-21 aircraft. On 3 June 2010, a Serbian Air Force Orao, piloted by Major Slobodan Jocić, crashed in central Serbia. The aircraft's landing gear malfunctioned, forcing the pilot to direct the aircraft into a lake and eject. The pilot was rescued soon after the incident. IJ-22 Orao 1 This designation is applied to the 15 Yugoslav-built pre-production aircraft (including a few completed to INJ-22A Orao two-seat standard) with the non-afterburning powerplant and used for the tactical reconnaissance role with a centerline pod carrying optical and/or IR sensors. In other respects, the IJ-22A Orao 1 differs from the J-22B Orao 2 in details such as its powerplant of two Viper Mk 632-41R turbojets each rated at 17.79 kN dry and supplied with fuel from an internal weight of 2,360 kg, length of 14.90 m including probe for single seat model or 15.38 m including probe for two-seat model, wheelbase of 5.40 m for single-seat model or 5.88 m for two-seat model, empty equipped weight of 5,755 kg, normal takeoff weight of 8,500 kg with reconnaissance pod, maximum take-off weight of 9500, maximum level speed ‘clean’ of 1,033 km/h at 8,000 m and 1,050 km/h at sea level, maximum rate of climb at sea level of 2,280 m per minute, climb to 6000 m in 3 minutes 12 seconds, and service ceiling of 13,500 m. J-22A Orao 1 This is the Yugoslav variant equivalent to the IAR-93A with a non-afterburning powerplant of two Orao/Turbomecanica (Rolls-Royce/Bristol Siddeley) Viper Mk 632-41R turbojets each rated at 17.79 kN dry, but the larger and more diverse weapons load of the J-22B carried on that variant’s higher-rated hardpoints. The variant first flew in October 1983 and was built only in single-seat form. J-22B Orao 2 This is the Yugoslav variant equivalent to the IAR-93B with an afterburning powerplant, integral wing tankage, the greater weapons load and diversity of the J-22A Orao 1, and Thomson-CSF HUD. The variant is being built only in single-seat form, and J-22A/B production will total 165 aircraft. 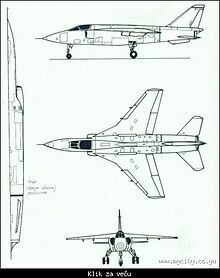 Yugoslavia planned a major upgrade of its J-22 Oraos with a radar and a computer nav/attack system integrated via a MIL 1553B digital database, but the dissolution of Yugoslavia and the civil war of the early 1990s made this an unlikely happenstance. NJ-22 Orao This is the dedicated two- seat reconnaissance variant operated by the Yugoslav Air Force with provision for a reconnaissance pod (with optical and IR sensors) carried on the centerline hardpoint. The type first flew in July 1986, and 35 were delivered in NJ-22A Orao 1 and NJ-22B Orao 2 forms with non-afterburning and afterburning powerplants respectively. The Bosnian Serb Air force formerly operated 7 J-22's. Picture - Yugoslavian J-22 Orao exhibited in the Museum of Aviation in Belgrade. Most produced J-22 aircraft were withdrawn from use and 16 of them are currently owned by aviation museums. Soko/CNIAR IJ-22 Orao 1 25001, prototype preserved at MJV Museum in Belgrade. 25710, preserved at Topola. 25719, preserved at MJV Museum in Belgrade. 25721, preserved at MJV Museum in Belgrade. 25723, preserved at MJV Museum in Belgrade. 25724, preserved at MJV Museum in Belgrade. Soko/CNIAR INJ-22 Orao 1 25606, preserved at MJV Museum in Belgrade. Soko/CNIAR J-22 Orao 2 25101, gate guard at Pančevo "UTVA" Aircraft Factory (first J-22 to break the sound barrier). 25107, preserved at MJV Museum in Belgrade. 25118, preserved at MJV Museum in Belgrade. 25120, preserved at MJV Museum in Belgrade. 25168, gate guard at Kraljevo-Lađevci Military Airbase. Soko/CNIAR NJ-22 Orao 2D 25505, preserved at MJV Museum in Belgrade. 25506, preserved at MJV Museum in Belgrade. 25509, preserved at MJV Museum in Belgrade. 25511, preserved at MJV Museum in Belgrade. Lambert, Mark (ed.). Jane's All The World's Aircraft 1993-94. Coulsdon, UK: Jane's Data Division, 1993. ISBN 0-7106-1066-1.